Will the GOP ever keep their promise about Obamacare? What’s the truth behind the Russian conspiracy? Why wasn’t I invited to the Donald Trump Jr. meeting with the Russian Lawyer (and do they have any of the refreshments left over) Those are just some of the big news stories, that may be discussed on today’s Lid Radio Show with special guest, Kenneth McClenton the Exceptional Conservative. Ken I will discuss today’s big political news with great insight and humor. Not only is Ken a great conservative pundit, who provides insight into the day’s news but also..well…let’s just say when Ken and I get together, along with the great political insight but also things tend to get funny. You see Ken is my brother from a darker mother. So so join in on the news and the fun— tune into the Lid Radio Show at 2pm Eastern by clicking on these SHR Media network or High Plains Talk Radio links (or by using the player and chatroom below). 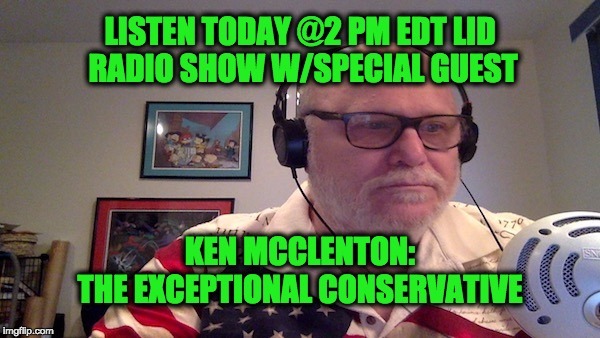 Ken McClenton’s official bio says he’s an Urban Conservative whose mission is to spread the good news of Christianity, conservatism, capitalism and constitutionalism throughout the world. Devoted to life, liberty and the pursuit of happiness, he believes that in order to save the United States, we must mutually pledge our lives, our fortunes and our sacred honor to save urban America. That is true but there’s more. Kenneth McClenton is host of the incredibly successful “The Exceptional Conservative Show” seen on TECN.TV Monday-Thursday 9pm to 11pm Eastern.